Earlier today, I posted a question on Cheap Recipe Blog’s Facebook page, asking people what they would put on a “superfood pizza”. Thanks to you guys, I got some great ideas and was able to create an extremely delicious pizza (for real!) that I don’t have to feel guilty about eating. 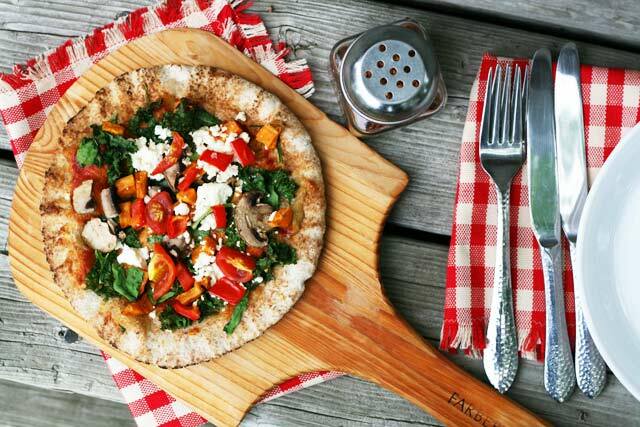 So What Is a Superfood Pizza Anyway? For cheese, I used Feta, which is a lower calorie choice but also very flavorful so I could use less. The crust is simply a whole wheat pita shell, one of my favorite alternative pizza crust options. All in all, the flavors blended really well together. A paleo cauliflower pizza crust would up the healthiness of this pizza even more. This pizza could easily be made vegan by using vegan cheese or leaving cheese off altogether. The sauce and veggies hold their own in terms of flavor. Now that I’ve made a veggie-based superfood pizza, I’m beginning to think of ideas for a fruit-based superfood pizza with blueberries, raspberries, strawberries or cherries. Does anyone have any ideas to share? You did me right one time, lovely readers. Now I want to hear from you again! To save money, take a trip around your local grocery store salad bar to purchase small amounts of toppings for your pizza. Some items are cheaper at the salad bar as opposed to buying them individually. Preheat oven to 375F. In a small food processor, blend garlic, olive oil, and tomato paste until smooth. Spread sauce evenly on pita shells. Add toppings. If you can do so safely, place pita shells directly on oven rack. Bake for approximately 12 minutes, or until pizzas are nicely golden brown. This pizza looks delicious! What a great way to enjoy pizza without all the guilt! Call me weird, but I don’t need my pizza to be topped with loads of cheese to fully enjoy it! Not only does this have all my favorite ingredients, but wow, wow, wow, does it look amazing! Love the photo set up 🙂 Makes me want a bite!! Yum! Love how colorful that pizza is and your (?new?) pizza board from your garage-saleing? I have made a fruit based pizza with a fig jam as a “sauce” – though you could easily use a raspberry jam, topped with goat cheese, shaved onions, rosemary, and apricots. Not sure how “super food” worthy that is, but it’s a start anyway! That is indeed the new pizza board that I bought at garage sales last weekend 🙂 Thanks for noticing! Your fruit-topped pizza ideas sound amazing, by the way. I also topped it with arugula. So I guess that takes away from the fruitiness too! I definitely want to try this one! Thanks Haley! Drizzle with a little garlic and chilli oil to finish and… perfect!